This was a very slow process, not everything was put in at once. The switches went in first (for emergency lights) followed by the MCS2000 800mhz. The NMO trunk mount from my previous vehicle I used on the hood as seen in the pictures For the MCS. 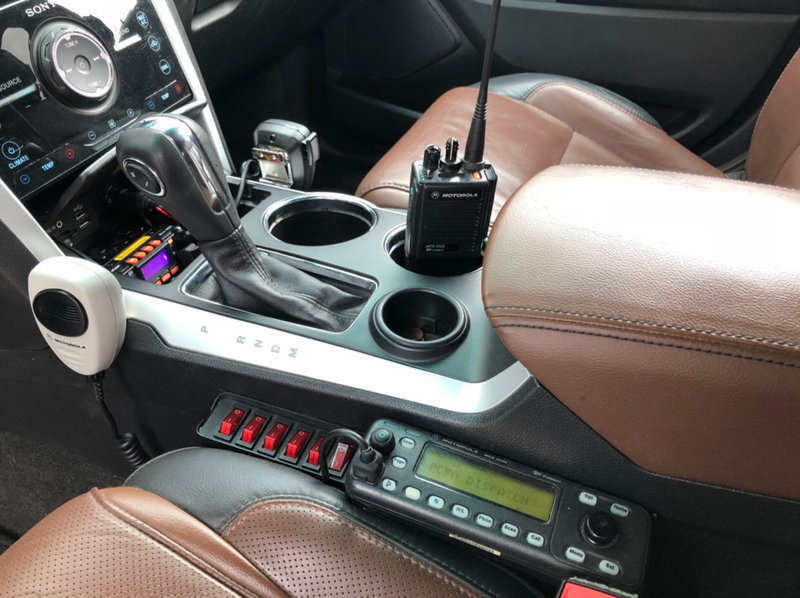 The radio in the center console is one of those Chinese knockoffs with the UV-5R firmware. Surprisingly it works okay, and it fits great in the console which I can close and you should have no idea it’s there. I had been running it off a mag mount since I got it. Just yesterday i got enough courage to drill a hole in the roof and installed the Roof NMO mount. I got my explorer from my dad—unfortunately it has DUAL sunroofs! So not much antenna space and more rattles!! As you can see in the roof antenna picture, you can definitely see where the mag mount was for so long. But I might add more NMO mounts behind and to the left and right of the center one. We will see...let me know what you think, I will let you know if I update anything! Looks good. Could you post a wide shot of the entire rig if you don't mind? You did an awesome job. What is the HT used for? Hope this is good/what you wanted, haha! 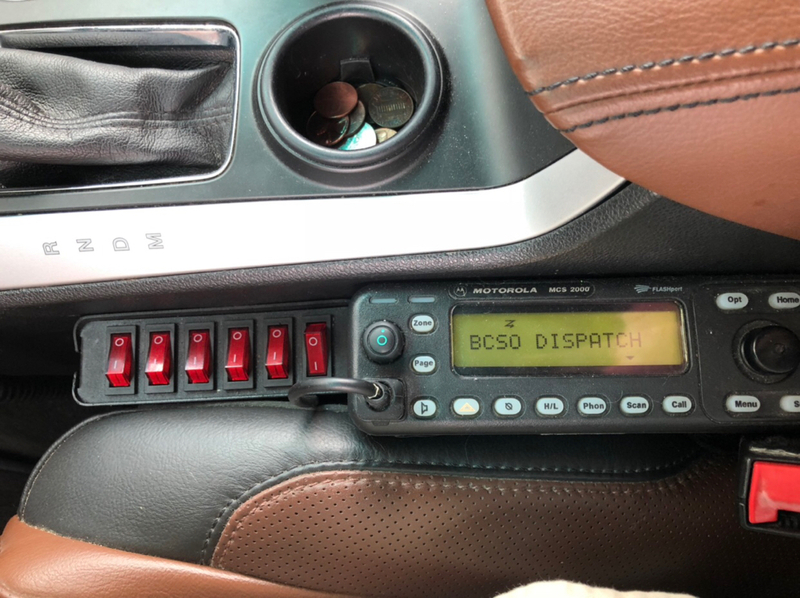 The HT is pretty much identical to the MCS in the car, programming wise, it’s a MTS2000, programmed up for the county’s trunked system, just like the MCS2000, I just threw it in there for the photo. It’s my chosen everyday carry radio when I am in the county and want to listen to public safety. Thanks for the pic I requested. Looks great. What kind of mount is the open coil on the hood, and are there any clearance issues when the hood is open? The mount on the hood is a NMO trunk Lip Mount I took off of my previous vehicle, I have no clearance issues with it, as long as the antenna is not too long, I did bend the antenna a little so it would point straight up (just so it looked better) and even then I had no problem with it hitting the glass. 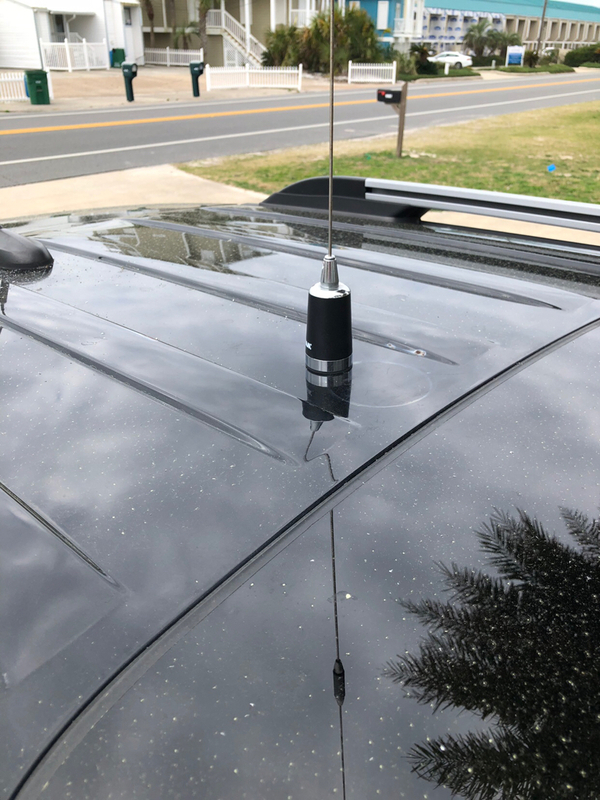 Did you put any kind of backing plate under the roof antenna? I found the roof panels to be very thin, in the order of an aluminum can, so I put a 1900 box cover on the inside to stiffen up the roof on the 3 antenna's I installed so if the antenna gets hit it woun't tear a hole in the roof. I have the 2015 PD version that was built for admin, same color as yours black with black cordura interior, full carpeting with a black grill ( nice car ). I was able to get due to a screwup by the dealer, but that's another story for some other time. 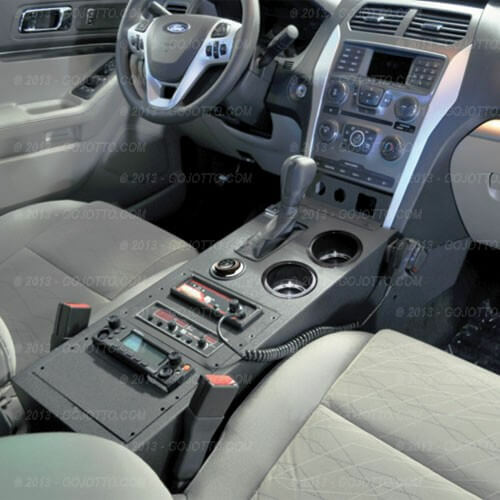 It has the center console but no shift lever. 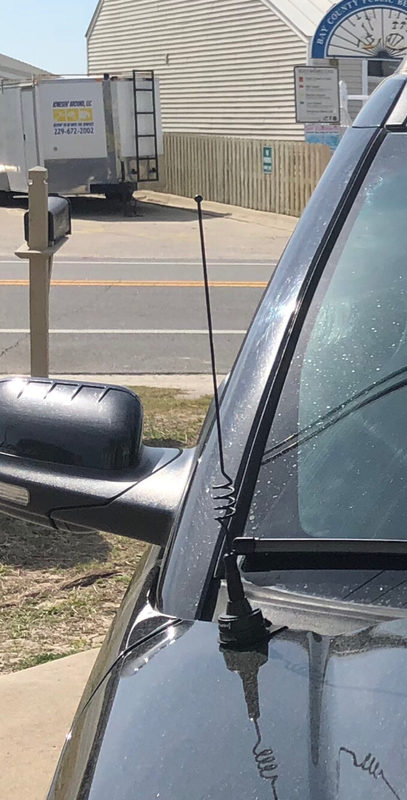 There are a total of 4 antenna's on the roof including the AM/FM antenna, so I took the total roof dimension from edge of windshield to edge of roof line by hatch and divided it. I don't know if civilian Explorers has this, but the entire inside headliner was attached with magnets. Dropped the roof liner and after drilling the 3 holes and putting the backing plates ran all the coax down the passenger "B" pillar. Radios are mounted under both the drivers and passenger seat mounted to the roll cage frame that supports the seat. There is also room in the compartment behind the rear seat where I put a vehicle repeater. 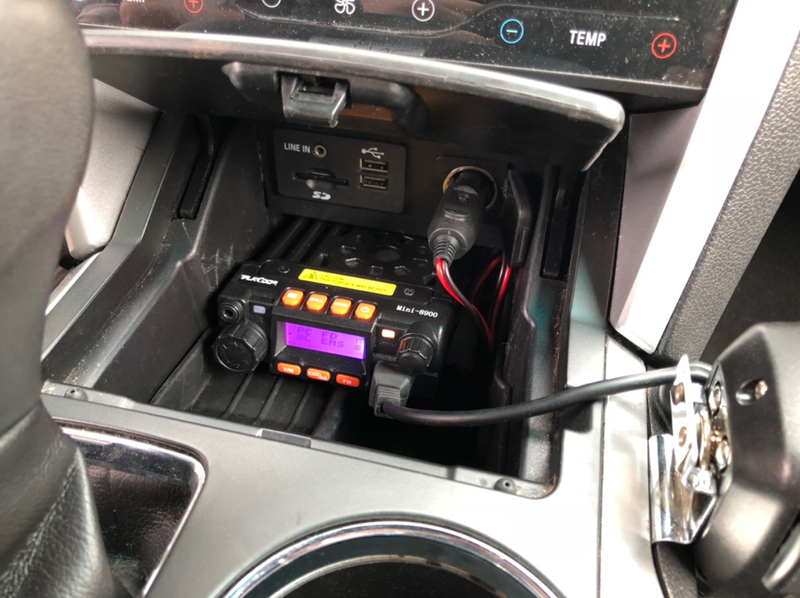 I built a custom cable setup that takes 3 radios one for each band VHF,UHF and 7/800 using XTL5000 and Astro Spectra's and runs them through one control head. How did you run the coax from the hood? And the power wire into the cab? Looking to upfit our 2018 XLT. The vehicle came with the power outlet option, so it has a 50 amp breaker in the passenger rear side panel behind the rear seat. I only really use one radio at a time (110w radios) so 50amp is plenty of power, I had to tap the IGN source from the AM/FM radio feed fuse which I ran to a relay so the radios went on off with key and or delayed ACCY. I didn't have to run any power or antenna cabling to under the hood, and if I remember correctly the up-fitter guide states (for vehicles W/O the power option) to run wires out a grommet on the passenger side kick panel, and then behind the plastic inner fender. I have had to do that on both my 2005 500 (many years ago) and 2013 Taurus which were all bought new, and never had a problem. The easiest thing to do was pull the inner fender off (6 screws and some pop offs) and then run the wires using wire loom to protect them from chaffing behind the inner fender. Then run them across the frame support in wire loom to the battery. 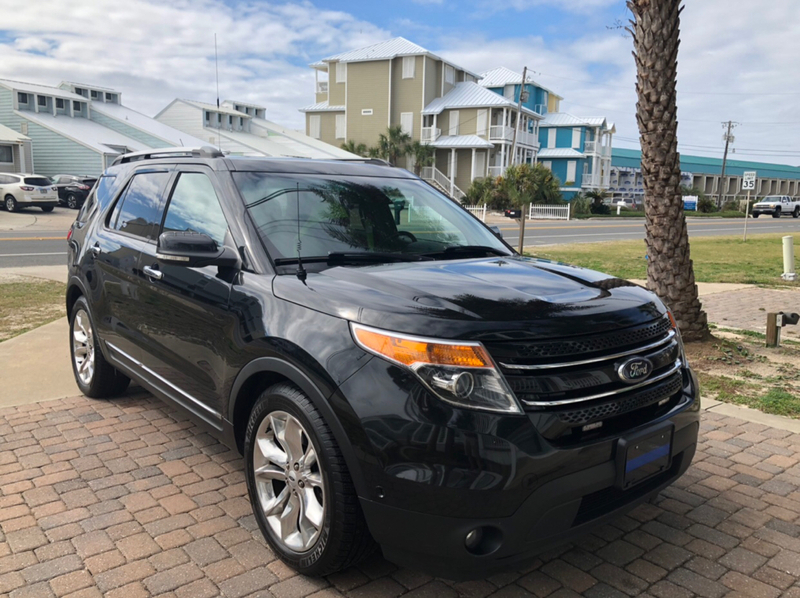 I have to redo the 2013 which had an Astro Spectra W-3 HHCH (total undercover install for when my wife used the car) as my son now uses the car and he needs a Astro Spectra W-9 installed for our FD. Going to be interesting to find a spot for the W-9. he needs a Astro Spectra W-9 installed for our FD. Going to be interesting to find a spot for the W-9. Why the W-9 head? Siren? We use the W-4 head with the siren. The only upfitter guide I have found is for the Police package, and unfortunately this XLT did not come with the accessory inverter and power besides the standard 12v sockets front middle and rear. I don’t want to power the radio from those. Your best bet is to run the power wires as I have described through the passenger kick panel. I have a W-9 from another vehicle that why I am using it. On the 2005 I removed the stock radio and used a 2 din radio and a W-4. No chance of that in the 2013, all integrated with GPS, enviromental controls etc. Nice, but since you are very close to the ground going through there, and subject to rocks, and dirt being kicked up. I would use some wire loom to protect your cabling. If I get to reinstall my sons radio this weekend, I will take some pictures of the cabling. Oh man...I didn’t even know they made them for the fords with the gear shift in the center! I will definitely look into it!